I have been in the business now for more than 30 years, and have spent a lot of time sourcing guides for clients. At the end of the day, I find that what people most remember about their trip is their time with a wonderful guide. John is perfect. You will be wowed. Hi John… just a shout out to thank you, for our wonderful experience through your guides, during our recent trip to London. Russell, our guide was superlative, and impressed us, not only with his knowledge but especially his wit….truly fun and entertaining! The Cotswolds will be on our list again! Hi John… David is simply amazing! Thank you for arranging our past two perfect days. We even loved the hailstorm! I just wanted to thank you for setting us up with Ruth. She was FABULOUS and we appreciated her knowledge as well as her kindness. She made our tour FABULOUS! Thank you again and please tell Ruth hello from the Vegas crew! John – I just wanted to say thank you for the Windsor Castle tour help on Sunday – and to sing the praises of Juliana – she was truly magnificent as a guide. My group of 3 all truly appreciated her insights and support during the day. And I know you didn’t order the weather – but that was great too! Again, thanks for your help and I just wanted to say thanks again to Juliana. Hi John, I wanted to write you and let you know what a splendid tour Leo did for us on Monday, April 3rd. She did an amazing job of touching on the interests of everyone in our diverse group of 10! We toured Westminster Abbey, saw both the horse guards and marching guards (this was amazing! ), had lunch at a lovely pub, did the Tower of London and finished our day with a stellar birdseye view of St. Paul’s. Leo also gave us pointers on how best to see the Sky Garden and Greenwich. Kudos and many thanks, Leo, for a job well done! You made our visit to the beautiful city of London even more amazing. We returned home last night after a wonderful trip. The tour on Friday with Jim was excellent. Jim did a masterful job of managing the group consisting of my parents (we convinced dad to purchase a cane at Highclere Castle) and our grown sons and their wives. We had a fun lunch at the pub near Highclere and the day was truly memorable. We miss you already! You were an amazing guide. You really made our trip quite brilliant. Not only are you exceptional at your job, but you’re an extraordinary person, with great wit. It was a pleasure to travel with you for 4 days. John is the best! He knows everything: history, hotels, restaurants, scenery. He quickly picks up on your interests and quirks and caters to them. He’s fun, funny and a great story teller, young, but not too young, and handsome. He knows how to see the big sights at the best times, and knows the tiny ones that you’ve never heard about. He brings England alive like you cannot imagine.It’s even worth returning with him to places you’ve already been, because a day with him is like no other! Thank you for Ruth. She is a fantastic guide who is fun, funny, smart, kind and always sensitive to her clients’ needs. We enjoyed her immensely and she gave so much of herself during our time together. We had wonderful tours and felt we got the best of everything for first time visitors. We already miss Ruth! She made our first visit to London all the more memorable and special. Thank you John for introducing is to Ruth and for putting together a great set of tours for us. Hello John. First and foremost, thank you for creating an unforgettable London experience for us! Your gift of storytelling is masterful. You made history come alive for both a history buff (me) and history novice (Carma). Your insights and anecdotes connect the historical to the present day seamlessly and entertainingly. And Ray was in his truly element for our half-day Windsor Castle tour. He shared stories on the drive out and back, and once on the castle grounds, his enthusiasm and delight really shone. Couldn’t imagine a better guide through the castle and St George’s Chapel. John, we are home and basking in the post-trip glow, plus the laundry from hell, and the jet lag to match. Last night we were talking about the enormous difference you made in our trip experience. If ever there was the perfect guide, it is you. You are knowledgeable, not stuffy, funny, flexible, and I could go on and on. You clearly like what you do, and I hope your success doesn’t undermine your writing, because I’ll bet you are a terrific writer also. Hi John. Our day in Windsor with Ray was fabulous. He was a wonderful guide in every way. Thank you for him. We also loved Ruth and we feel she an innate talent for guiding. In fact we feel she is among the best. Approachable, knowledgeable and likable. She is a treasure. Keep her on your list. What she has one cannot learn. John, thanks again for the wonderful tour of Blenheim Palace and the Cotswolds. Your extensive knowledge of the area made the places come alive. The chance meeting of your friend Julian Fellowes was special for Kristy and something she will always remember. Until next time. John, I just wanted to let you know that we received a glowing report from my client – especially about you! He said you were absolutely AMAZING!! Thank you from the bottom of my heart for doing such professional work and looking after my clients so well. John, thank you again for a wonderful time! Our day with you was a highlight of our trip. My kids just couldn’t understand why we didn’t arrange to have you with us every day. Thanks again for everything! John was an excellent guide who worked with us to put together a personalized tour around London. He really made the locations and history come alive with his detailed narration, and he took the time to point out many of the interesting sites along the way. We’d highly recommend him to anyone visiting the UK whether for a tour of the highlights or for an in-depth look at London’s history. – Missy and Don Foose, USA. John, just wanted to thank you again for the wonderful tours you gave my family when we visited London. We thoroughly enjoyed every minute and my children are still repeating the wonderful stories you told them. It has been such a pleasure to hear my son regale his friends with tales of Winston Churchill and Thomas Blood! Thank you again for a perfect introduction to London. We’ll see you again on future trips! I really want to say THANK YOU, THANK YOU, THANK YOU, for showing Kris and me around Hampton Court Palace, and the “nooks & crannies” of London. Not that I ever doubted it, but a group tour doesn’t begin to do justice to sightseeing the way your personal service does. John, thank you so much for the wonderful tour around London. We all had a great time and your terrific ability to summarize and synthesize English history was a pleasure to hear and now really makes the city come alive for us. When we are back in London we would love to meet up with you again and if you should make your way to the US please let us know and perhaps we can show you around a little in our area. Have fun in Cornwall and also in Greece! Thanks John…trip was great…your tours made it special…repeating all your stories and giving you most of the credit… we’ll track you down on next trip to London cause the boys still claim you’re the coolest guy ever…high praise! John, a thousand thank you’s for all your insight and experience. We had such an enlightening and unforgettable time. We could never begin to peel as much skin off of London if we were not guided by such a wise and eloquent companion. John, thank you so much for everything. We had an incredible four days in London, but by far the best day was the one spent with you. We look forward to seeing you our next time around. John was great! We (4 adults) used John for a walking tour of London to see a few of the top sites. It was time and money well spent. We moved efficiently around the city, avoiding crowds wherever possible with his knowledge and Blue Badge status. He also provided rich historical context such that we appreciated no only the locations but the people that made it famous. The tips and ideas he gave us set us up to enjoy the next few days on our own. John, I just wanted to send out a quick email to thank you for the wonderful tour you ran for me and my family. All of the stories and interesting historical snipits that you had to compliment the sights were just plain cool. You really inspired the imagination and helped bring alive the history of the city. I could hardly have been more impressed. Many thanks. John was fantastic! We had a great day with him visiting Stonehenge, Avebury & Bath and really got immersed in the history of these places through his in-depth knowledge of fact and legend. We’ll definitely use John when we return to explore other areas. A wonderful day! 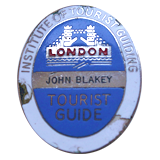 If one is looking to experience the culture, history, scenic attractions and folklore of the Cotswold’s, they need to look for further than, John Blakey, the best Blue Badge Guide in England. You will be met by an energetic professional with an abundance of knowledge that will make your time with him a lasting memory. It is evident that John’s aim is to exceed the expectations of his clients. 10 star. John was the very best. Great knowledge, very helpful, very personable. The Blue Badge Service is lucky to have this gentleman. He was the top highlight of our whole trip. 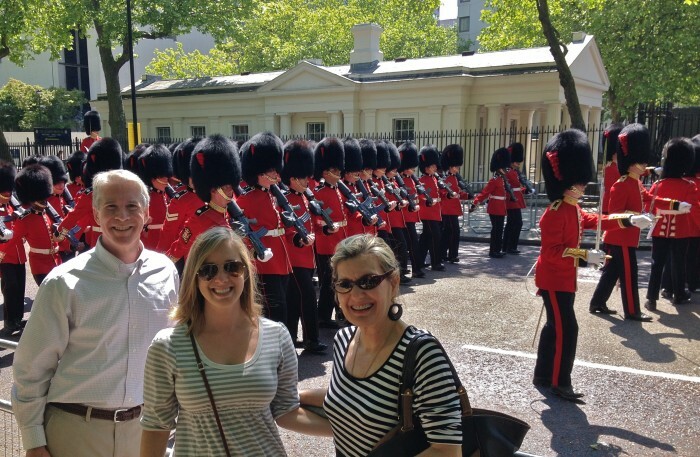 In July 2013, my husband and I invited our family to visit London. There were eight of us, including 3 grandchildren, ages 6, 8 and 10. My husband and I had been to London dozens of times and it is our favourite place. Because we had a large group, I decided to hire a guide who would be great with children, and have excellent knowledge of London and the area around London. I selected John Blakey. I had read many glowing reports about him, and contacted him a year in advance. He put together a three-day tour for us that was exceptional. After 4 nights in London we flew to Barcelona for a Mediterranean cruise on a ship that had everything for children. Here is the best part about the entire experience. When I asked what was their favourite part of the vacation they said London and John! I agree. We had a great time with John. He is a wonderful guide and has a wealth of knowledge. He gave us a very interesting tour of Westminster Abbey and took us into several other neighbourhoods that you would be unlikely to come across as an outsider. Great experience. Dear John, Thank you for a wonderful experience! It will be a day we never forget. My son and I enjoyed the history and all the information that you shared with us. Thank you for making our tour memorable! John, thanks again for such a great tour of London; it was our best day of the whole trip! John, I just wanted to thank you again for a truly educational and memorable trip to Stonehenge and Avebury. I think my family has come close to telling me “enough already” as I keep regaling them with your stories of English history and your abounding knowledge on the subject of all things Stonehenge. I couldn’t have had a more appropriate guide. I loved skulking around the long barrow and we will definitely have to put Windsor Castle on our itinerary when we next visit. A quick note to say how much we enjoyed John’s tour during our London visit last week. He’s got such a pleasant style about him and really made good use of our time and young daughters’ limited attention spans! Thanks so much! Thank you for your wonderful English hospitality, we had a fabulous two days. You made our visit to the English countryside beyond our expectations “just brilliant”! John, thank you for a most wonderful three days in the Cotswolds. We have enjoyed being with you and appreciate your knowledge and your excellent driving as well as your company. We look forward to Dorset in June. John, I feel we were most fortunate to have you as our guide in London. We conserved time and got into the places of greatest interest to us. Your knowledge of the area and warm demeanour in sharing information was meaningful and fulfilling. My acute interest in WWII made the tour of the war rooms gratifying. It added dimension to what little I knew of the site. London is fascinating and I hope to return someday. Thank you for a job well done. God bless you richly. John helped make a recent trip to England a truly outstanding experience. His knowledge and expertise are truly exceptional, and he made the history and the sights of London come alive. I surely hope to return and once again, with John’s help and guidance, see the beauty of England and learn more of its history.